The Rogers rely now on Greg's wages from his job with a company that installs insulation. Greg and Keta Rogers, who live with their three children in Del City, are uninsured and may remain so next year in the wake of Gov. Mary Fallin's decision not to expand Medicaid. Here, Greg plays ball with his 12-year-old son Elisha (left) and nephew Kaleb Pennon. Keta cooks with her 14-year-old daughter Maeahja, who, along with her two siblings, is covered by government-provided insurance. Keta was laid off from the Del City Housing Authority a year ago but still had health coverage while she was pregnant with Triumph, now 10 months old. Keta is now uninsured. Despite being unemployed, Keta Rogers works hard in the home and as an avid volunteer for her church. Maeahja, 14 (left), the Rogers' eldest, plays with (left to right) cousins Toriana and Ty'Sheauna Pennon and Keta's sister Maeisha Pennon. Greg said he worries about the couple's lack of health coverage, but can't afford it now as he is paying $27,000 over three years for apprenticeship certification. William Noel is pastor of Grace and Glory Baptist Church in northeast Oklahoma City, which sponsors a free clinic that Greg Rogers has visited. Noel also is uninsured, saying his church can't afford to provide coverage. The health-care fate of tens of thousands of low-income parents is in limbo because of Oklahoma’s refusal to accept federal money to expand Medicaid. Most of the attention so far on which Oklahomans will not gain access to Medicaid in 2014 under the Patient Protection and Affordable Care Act has been on adults without children. That group makes up most of the roughly 200,000 Oklahomans of working age who would have been covered if Gov. Mary Fallin had agreed to expand Medicaid, which provides health coverage for the poor, the disabled, children and others. But also excluded will be as many as 50,000 Oklahoma parents with dependent children living at home, according to one study by a nonpartisan research group. That represents about a fourth of all low-income adults who would have been eligible for expanded Medicaid — the 13th highest share in the nation, according to the study by the Urban Institute, a nonprofit group based in Washington, D.C.
That prospect leaves some uninsured parents on edge. Although their children may get health insurance through federal or state programs, the parents’ health remains critical to the family’s overall well-being. Greg and Keta Rogers, of Del City, are among those parents. The couple, who have three children at home, do not qualify now for the state’s Medicaid program, called SoonerCare, because their income is too high. They will not be eligible for Medicaid under the Affordable Care Act because of Fallin’s decision not to expand the program. Fallin said she believes the state can’t afford expansion and would become more dependent on federal money that might be unavailable in the future. The parents, like others, may also have no insurance options next year. That’s because they fall into a coverage “crater.” Greg’s income is too high for Medicaid now, yet also is slightly too low for the couple to qualify for buying subsidized coverage on a new federal health exchange, where people can shop for insurance online. From 130,000 to 170,000 Oklahomans are facing the same situation. Greg, 40, said the lack of insurance causes him to avoid going to the doctor. He said private doctors won’t see him because he can’t afford the fees. Keta, 38, lost her medical coverage last year when she was laid off. “There have been days when I felt too sick to get out of bed,” said Greg, who works for a small insulation company that doesn’t provide health insurance. “But I can’t afford to miss work. My family is counting on me. So I drag myself out of bed and do what I have to do to take care of my family. Without expanded Medicaid, questions remain as to what options the uninsured poor will have. The Affordable Care Act offers two main avenues to health insurance coverage starting on Jan. 1, 2014. One is through Medicaid expansion, encompassing those with incomes up to 133 percent of the federal poverty level. The other is through a government health-care exchange that allows individuals and small businesses to shop for health plans online. People making between 100 percent and 400 percent of the poverty level can buy subsidized insurance on the exchange using tax credits. Fallin decided not to set up a state health-care exchange for Oklahoma, so a federal one will serve the state instead. Oklahomans who would have gotten Medicaid under expansion are a diverse group, according to the Urban Institute study. More than half are between ages 19 and 35, and more than three-fourths live at or below the federal poverty level, which is $11,170 for an individual and $23,050 for a family of four. About 60 percent are white, and most are men. An estimated 24 percent are parents, compared with 18 percent nationally. William Noel, pastor of Grace and Glory Baptist Church in northeast Oklahoma City, which sponsors a free clinic, said many people would be surprised at the variety of uninsured Oklahomans. “These aren’t homeless people who don’t have jobs. In our free clinic, we see people all the time from various professions – teachers, small-business owners, and a lot of truck drivers. “In fact, I don’t have insurance,” added Noel, saying his church can’t afford to provide coverage. Many low-income adults do not qualify for Medicaid, which is typical in most states. To qualify, they must fit a very specific category, such as being pregnant or disabled. The ineligible adults include many parents. For a family of four in Oklahoma, non-disabled parents must make $6,996 or less a year to get SoonerCare. “Basically, for parents to qualify for SoonerCare, they have to be essentially destitute,” said Carter Kimble, a spokesman for the Oklahoma Health Care Authority. The Urban Institute estimated that 53,000 parents in Oklahoma would have gotten Medicaid with the expansion. About 60 percent of those are in the “crater,” so they can’t buy affordable coverage on the health exchange. * They can obtain coverage through Insure Oklahoma, which offers subsidized plans to individuals and workers at small businesses. But the program is now limited to about 35,000 enrollees, and a participating business must have a qualified health plan. Alex Weintz, a spokesman for Fallin, said the governor is looking at expanding Insure Oklahoma to offer more affordable care. But on Jan. 1, 2014, Insure Oklahoma will lose nearly two-thirds of its government funding when federal matching money stops, said Jo Kilgore, a spokeswoman for the state Health Care Authority. Weintz said, “We’re hoping that won’t happen, but it is true that funding for that is in jeopardy.” He said the Obama administration is being inflexible and impeding its own goal of getting more people insured. “What they’re saying is, ‘It’s my way or the highway,’” Weintz said. * An insured worker at a business with fewer than 25 employees can seek discounted coverage through an Affordable Care Act program. But the employers must meet certain criteria and do not have to participate. * People who earn between 100 percent and 400 percent of the poverty level can use tax credits to purchase coverage from the health exchange in 2014. The poorest of that group will pay no more than 2 percent of their income on premiums as well as get a subsidy for other health costs, such as co-payments. * With no other options, the uninsured will continue seeking health care at hospital emergency rooms or free clinics around the state. Weintz said recently that the governor wants to work with lawmakers, businesses and the health community to find other ways to provide affordable access to care, but it is too early to provide specifics. “We know that we need to improve our health as a state,” Weintz said. Insuring more families is part of the answer, but sustaining economic growth and reducing preventable illnesses also are important. Recently, the Oklahoma Health Care Authority authorized paying a consultant $500,000 to determine how much it would cost Oklahoma to develop a state-based solution to improve coverage. 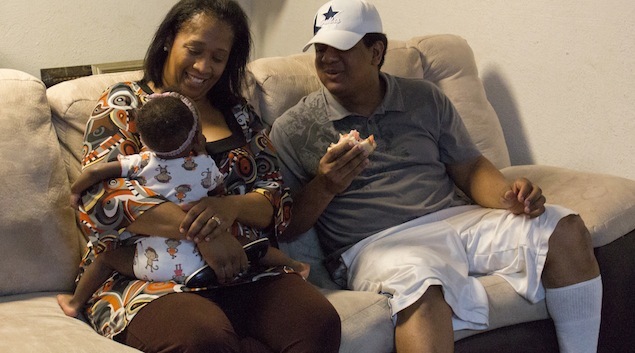 Greg and Keta Rogers’ safety net began fraying a year ago. Keta was laid off from the Del City Housing Authority. At the time, she was six months’ pregnant, so she qualified for temporary assistance from SoonerCare. Today, the couple’s three children – Maeahja, 14; Elisha, 12, and Triumph, 10 months – are all covered by SoonerCare. But Greg and Keta currently don’t qualify. Greg’s annual salary of $27,000 is well above the $8,184 limit for parents in a family of five to get Medicaid. His employer has only seven workers and doesn’t offer health insurance. They will not qualify next year either and may not be able to buy subsidized coverage on the health exchange, because as of now, Greg’s salary is slightly too low. Their best hope may be to raise their income to just above the poverty level. That would move them out of the crater and into the window of 100 percent to 400 percent of poverty to be able to get discount coverage on the health exchange. This could become a goal for thousands of Oklahomans living just below the poverty level. One risk is that the subsidies could go away if a lawsuit filed by Oklahoma Attorney General Scott Pruitt is successful. The lawsuit contends that the federal health law is worded in such a way that subsidies can only be offered through state exchanges, not the federal one that Oklahoma will have. Greg Rogers is already trying to boost his pay. He awakens at 5 a.m. and works at his full-time job until about 3:45 p.m. He then attends classes as part of a three-year apprenticeship that will ultimately earn him a certification that can lead to higher pay. The apprenticeship costs $27,000. “I remember one day a man (from an outside insurer) came to talk to us at work about signing us up for health insurance,” Greg said. “I knew I couldn’t afford it before he even began to talk. Right now, I have money taken out of each check to pay for the apprenticeship. We need every penny I make just to get by. Without Medicaid expansion in Oklahoma, roughly 200,000 people, mostly adults, will remain ineligible for the program.